When you notice that your windows are not working as they normally should and if repair won’t cover it, you might want to consider replacement. As most homeowners don’t often get their windows replaced, there is the dilemma of not knowing what to do when the need arise. This is a common problem but something that is quickly manageable if you have the right help. There are so many options when it comes to window replacements. There is a wide array of styles, materials, such as wood and glass, the coatings as well as the color. It may seem overwhelming for first-timers to h andle all the details but it really is not if you know what to do. Here are the most common mistakes that people commit when h andling window replacement projects. Choosing price over quality. This is probably the most common mistake homeowners do. They end up choosing low-cost windows instead of purchasing good quality ones that can last for a long time. While not all expensive ones are the best, there are window replacement products that are truly worth the expense. Not purchasing energy-efficient windows. When you need replacement windows, always choose St. Charles, Missouri energy-efficient windows as these are going to work to your benefit. They help minimize energy consumption during the hot and cold seasons. Improper installation. Trying to cut expenses by doing DIY window installation can work for those who know what they are doing. Yet, a big percentage of homeowners are not knowledgeable about these things. You end up making a bigger mess which can be a waste of investment, time and effort. Getting professional window installation services will ensure that your windows are properly placed. Choosing a window company that has suspicious credentials. There is a big risk for homeowners who instantly fall for fly-by-night sales pitches. You may end up with subst andard materials and a sloppy installation. It is highly recommended to work with a local company with a proven track record. 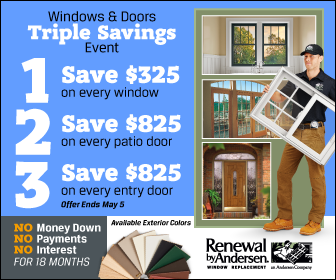 Renewal by Andersen® is just the best when it comes to window replacements and windows installation in St. Charles, MO. We have established a reputation as a trustworthy company that produces window products made of quality materials. Our windows are guaranteed energy-efficient because we underst and how energy bills can eat up a family’s budget. With our factory-trained technicians and years of experience in the business, you can always count on us for window installation. Renewal by Andersen® is a name you can trust, anytime, anywhere. Contact us now to find out more about our window replacement services!